It was one of those lazy, rainy weekend afternoons. You know the kind, where you sleep in as long as you possibly can, stay in your jammies all day and enjoy just being with each other. Well, Shaun and I were enjoying each other’s company. Mimi had disappeared downstairs somewhere. 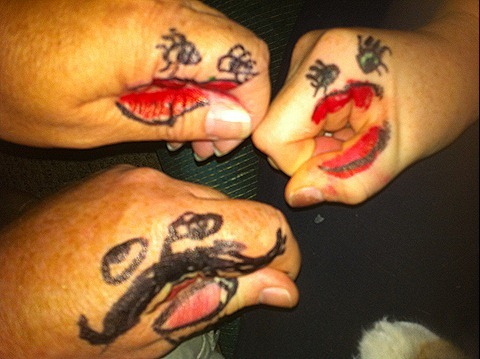 We got it in our heads that our youngest daughter wasn’t paying enough attention to us. Clearly something had to be done about that. One of us, (probably Shaun…only he would come up with such an odd idea) decided that what Mimi needed was to be pestered entertained with a puppet show. 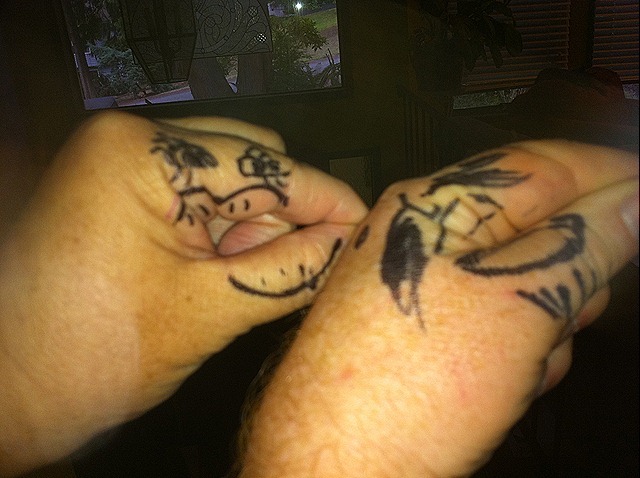 So with the help of a stray Sharpie, we worked for what seemed like hours creating beautiful realistic hand puppets. Suddenly Mimi got a huge grin on her face and grabbed a big bag of markers that was on the table in front of her. She begged us to create a masterpiece on her hand as well. It took some convincing (at least 10 seconds) before we set to work on her hand puppet. Aren’t they the most beautiful works of art you’ve ever seen? Our bad intentions may have been to annoy our girl, but it turned out that playing with her and having hand conversations with each other on and off throughout the rest of the day were much more fun. This entry was posted in Family, Humor, Love and Marriage, Mimi and tagged Hand puppets, rotting your brain, Sharpie, television, TV. Bookmark the permalink.